The Approach and return reference points define additional tool approach/return path to/from the first/last machining point. When used together with the tool change position approach reference points determine a tool path from a tool change position to the first machining point, while the return reference points determine a tool path from the last machining point to a tool change position. The approach/return reference points are specified under the Approach/Return section in the operation Setup panel. To set approach/return reference points you can select the following options from the drop down list. 1. Short - no additional points are added into toolpath. A tool moves from a tool change position to the first point of a machining toolpath directly by the shortest distance. 4. Custom. When you select Custom the Approach/return edit dialog appears. In the approach/return edit dialog you can define an approach/return tool path. The dialog is split into two areas. In the top of the dialog you can see the resulting list of reference points. Each line in that list represents a distinct point of the lead path. A point has the following format. If G53 is present in the beginning of a line the subsequent coordinates are the coordinates in the machine coordinate system, otherwise the coordinates are the coordinates of the tool tip in the current workpiece coordinate system. If no coordinate is specified after an axis name, it means the corresponding coordinate is calculated by SprutCAM automatically. For an approach path the coordinate is taken from the first point of the machining toolpath, for a return path the coordinate is taken from the tool change position. So, for example, if you set an approach path to "X Y; A;C; Z", the tool will move from a tool change position to the first point of the machining toolpath first by the X and Y axes simultaneously, than by A axis, than by C axis, the final motion will be a vertical plunging along the Z axis. In the bottom area of the dialog there is a list of machine axes. To add a new reference point to the path you should either fill the coordinates of the appropriate axes with desired values, and/or set some of them to AUTO by clicking on the ellipses button next to an axis. After that you should press the Add button. To delete a reference point just click on it in the top list and press the Delete button. To edit a reference point just click on it in the top list, the bottom list will be updated accordingly. After that you can change the reference point parameters. The Physic machine coordinates option in the middle of the dialog is used to set the mode of a reference point. When checked it turns a reference point to a G53 reference point. For a G53 reference point coordinates are specified in the machine coordinate system. Those points are output into a CLDATA using PhysicGOTO commands, while regular reference points are specified as coordinates of a tool tip in the current workpiece coordinate system. 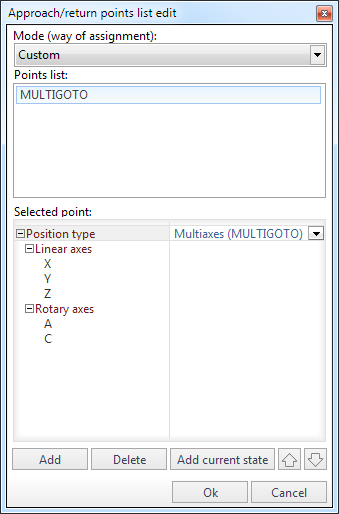 Those points are output into a CLDATA using GOTO and MULTIGOTO commands. As approach and return reference points can be specified in terms of machine axes without explicit coordinates values, it is possible to define for an actual machine standard approach and return sequences. E.g. for a five axis milling machine a default approach sequence can look like XY; A C; Z, a return sequence can look like Z; XY; A C.
Standard lead paths can be specified in the machine properties under the Approach/Return section and in the machine configuration file under the <Leads> tag.